We never thought creating a website for a medium’s reality TV show was in our cards, who knows maybe medium Carmel Baird did. The description of this site, by Brief, is apt and flattering, “Though bright, colorful and dynamic, the site also has an endearingly creaky feel.” It’s almost as if we had premonitions of our own. We are thrilled that an idea we spent months creating was delivered effectively– creakiness in tow. 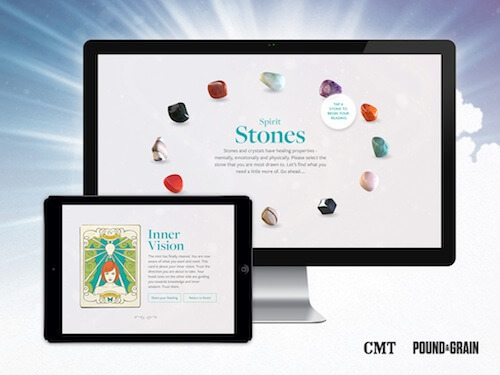 Creating a website for Mom’s a Medium was a new, exciting, territory we’d never ventured into before, and helping CMT, and Lark productions with their digital strategy to support their show, was not just an honour, but great fun. If you haven’t had your oracle cards laid out or picked your spirit stone yet, go ahead visit Carmel’s reading room for some spirited fun. Though bright, colorful and dynamic, the site also has an endearingly creaky feel.